Like most other ancient cities, Ephesus was surrounded by large-scale necropoleis. Except for a few examples, the typical burial sites were located in extramural burial areas outside the Hellenistic city-walls. Sanitary precautions and fear of defilement readily explain this law. 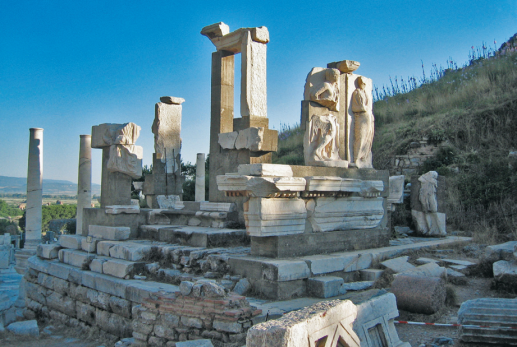 So, no matter from what direction an ancient traveler arrived in Ephesus, he had to pass a cemetery. Although no longer visible today the relationship between tombs and city appeared to be heterogeneous: On the one hand they were packed tightly around inhabited areas, on the other hand they were located on uninhabited slopes. The common denominator is their location in heavily frequented areas or next to major traffic routes; this made them noticeable and permanently present to the citizens of the ancient city. The structure, the architectural design and the furnishings of the tombs so prominently sited served as vehicles for any kind of status display and a definition of social hierarchies. Intramural burials were very rare, and they were granted by cities only as a mark of high distinction and were typically restricted to exceptional cases. In this paper several remarkable funerary and honorific monuments located along the Curetes Street are presented. The important rank of the owners of these monuments in Ephesian society was reﬂected by the centrality of their monuments within the civic landscape. The law of extramural burials changed to a certain extent in late antiquity, when Christians were allowed to bury the deceased adjacent to or even in churches. It was of no importance whether the churches were located inside or outside the cities. Together with the abandonment of vast mortuary areas starting at the end of the 5th century AD a ‘wandering’ of the Ephesian burial sites can be discerned. This change of the mortuary landscape from early Imperial to late antiquity within the capital of the Roman province of Asia will be the focus of this paper. The author would like to thank the director of the excavations in Ephesus, S. Ladstätter, for the publication permission and preliminary dating. I am indebted to N. Zimmermann, A. Sokolicek, A. Pülz, A.M. Pülz, A. Herda and Ch. Berns for numerous suggestions and discussions. I am grateful to Ch. Kurtze for the production of the maps and to N.M. High-Steskal for the revision of the English manuscript. 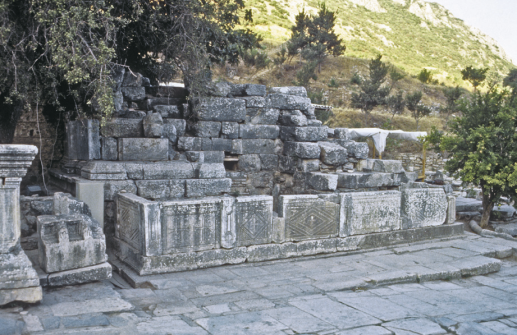 The study of the necropoleis of Ephesus is funded by the Austrian Science Fund (FWF-project P22083-G19). 1Like most other ancient cities, Ephesus was surrounded by large necropoleis (fig. 1). With a few exceptions they all lie outside the Hellenistic city-walls1. The major necropoleis are located to the west of the city on the northwestern slopes of the Bülbüldağ and the subjacent plains next to the harbor channel, in front of the Coressian Gate and the Magnesian Gate, as well as between these two gates on the northern and eastern slopes of the Panayırdağ, and on the northeastern slopes of the Bülbüldağ. But we also know of preHellenistic cemeteries that mainly lie in the area of the old Processional Way which was outside of the settlement at this period. These burial sites date to the Archaic and Classical period. 2In antiquity, no matter from what direction a traveler arrived in Ephesus he had to pass a necropolis. Although no longer visible today, the relationship between tombs and city appears to have been heterogeneous: On the one hand they were packed tightly around the inhabited areas, on the other hand they were located on uninhabited slopes of hills. The common denominator is their placement in heavily frequented areas or next to major traffic routes; this made them noticeable and permanently visible to the citizens of the ancient city. The structure, the architectural design and the furnishings of the tombs so prominently placed served as vehicles for all forms of status display and expression of social hierarchies. 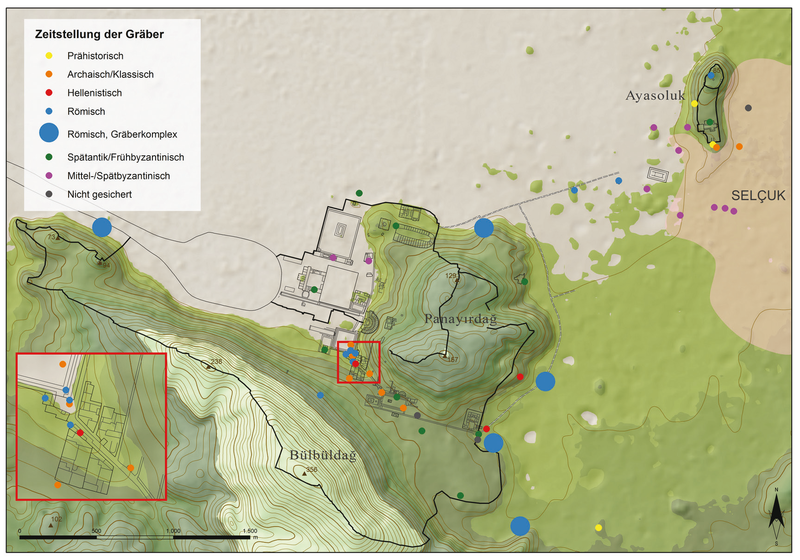 3The following paper includes results from my current project on the largest necropolis of Ephesus, the so-called harbor necropolis (figs. 2-3). This necropolis, located on either side of the artificial harbor channel to the west of the Roman harbor basin, is at least 450.000 m² large and was used from the 2nd century until the 6th century AD. 3 Cf. Stone/Stirling 2007, 17. 4 Cf. Ivison 1996, 99; Dagron 1977, 1-25; Ariès 1981, 29-92. 4If we ignore the extramural burials for a moment, Ephesus appears to have had a long history of intra-urban burials. After their frequent occurrence in the late Hellenistic and Augustan period, only a few examples of intra-urban burials are known from the Imperial period. 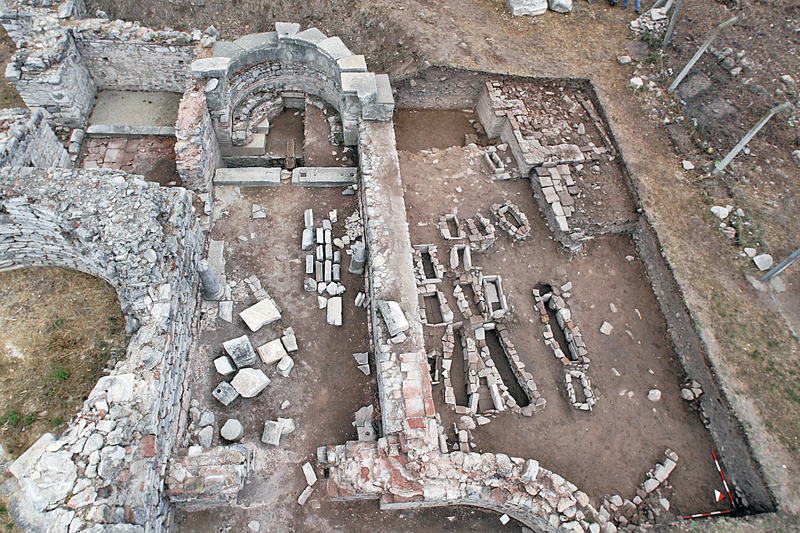 Intra-urban burials again become common practice in the middle-Byzantine period when burials surround churches2. The earliest examples are honorific tombs and monuments and thus only represent an elite minority. But the later examples can be demonstrated to reﬂect changes in burial customs3. Although the majority of the burials from the Byzantine period would have still been placed outside the urban context, the incorporation of cemeteries into the urban fabric and their connection with Christian churches was a clear break with ancient traditions and simultaneously marks a central element in the definition of a Middle Age city4. 6 Cf. Cic. leg. 2.23.58. 7 Cf. Kolb/Fugmann 2008, 14; Cormack 2004, 38. 8 Ivison 1996, 102; cf. Cod. Theod. 9.17.6; Dig. 47.12.3; Cod. Iust. 3.44.12; Epitome Legum 11.39.43. 9 Leo VI, Novellae 53. On the sources cf. Schrumpf 2006, 64 fn. 168. “The extramural basilicas erected over the graves of the martyrs were attractive burial places …, for the holy relics sanctified their locale, and so blessed the deceased. The greater the proximity of the dead to these relics, the more potent the saint’s intercessions on their behalf. When relics moved within the walls, to sanctify churches and to protect cities, it was logical that burials should follow”12. “We see here how mortuary practices can often serve as a prime means by which ancient communities expressed their group values, with tombs serving as the material representation of these identities and marking a physical presence in a territory”13. 7Consequently the responsibility for the burial slowly shifted from the city administration to the church authorities14. 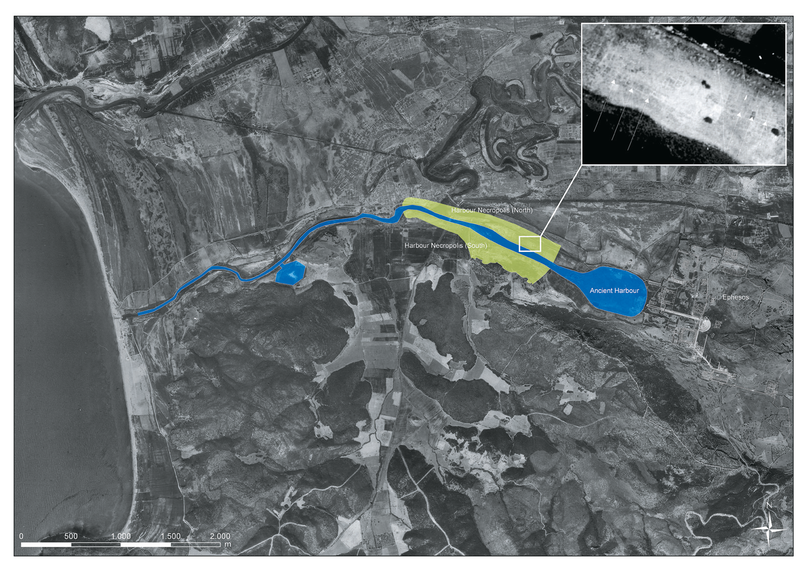 This development will be further explained in the following paper. 16 Cf. Hesberg/Zanker 1987, 9-20; Berns 2003, 20, 24, 27-30, 52. 17 Berns 2003, 24-25. Contra: Thür 2009, 13-14. 8Already in the late Hellenistic period the privilege to bury outstanding citizens within the city is attested in Ephesus (fig. 4)15. Burial monuments were understood in the same way as personal honorific monuments16. Their location within the city was supposed to arouse the maximum amount of attention: the position within the city secured a large amount of public attention and signified an exceptional honor. The functional diﬀerentiation between a burial monument and an honorific monument is not possible in this context17. This outward focused form of self-representation was encouraged by the considerable competition among the city-elite. Time and again there were attempts to surpass existing monuments with new patterns, the unusual articulation of details and a special location within the city. 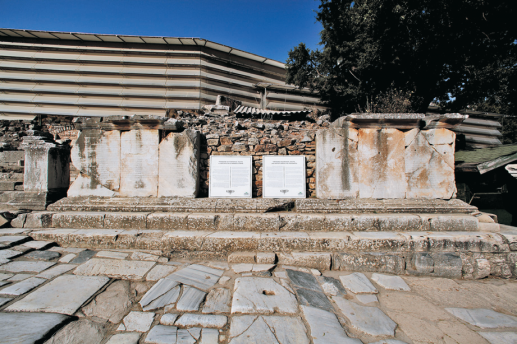 9One example of an intra-urban burial is the Octagon situated along the Curetes Street, the ancient Embolos, at the center of the city (fig. 5)18. 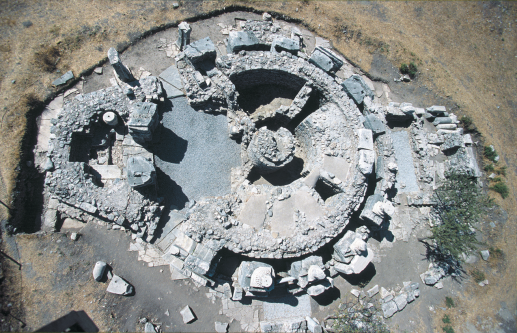 The Octagon lies at the lower end of the Curetes Street, an important urban section of the old processional way, and is a true burial site (fig. 4, no 47). According to the newest studies it was built at the end of the 1st century BC19. It is still debated if the Octagon actually functioned as the tomb of Arsinoe IV, sister of Cleopatra VII, who was murdered in Ephesus in 41 BC. But this discussion is not relevant to this paper. A sarcophagus with human remains was discovered in the pedestal of the monopteros that has been associated with her. Despite the uncertainties concerning the person buried in this richly furnished structure in prominent location, the tomb served a high-ranking person who received the privilege of an intra-urban burial. 21 Contra: Jones 1993, 149-152; Engelmann 1996, 131-133. 22 Cf. Steskal 2008, 14-15 with additional literature. 24 Cf. Kerschner 2008, 109-118. 10To the west lies the neighboring so-called Heroon of Androclus (fig. 4, no 48)20. This monument was combined with a fountain and did not contain a burial chamber (fig. 6). It was erected in the first half of the 1st century BC. Many scholars claim that it is an honorific building dedicated to the mythical founder of the city, Androclus21. Burial places and cenotaphs of the mythical founders of ancient cities were instrumental in the self-definition of the poleis. In this context the honorific monument for the city founder is supposed to remind of the old age of the city and the heroic genealogy of its citizens. Through such mythological-genealogical argumentations the cities tried to define status and rank amongst themselves22. But the interpretation of the Ephesian building as a heroon for Androclus is problematic. The heroon described by Pausanias and the actual burial of the founder must be diﬀerentiated23. If Androclus can even be considered a historic figure, he could have been buried both inside as well as outside the city since burial laws for the end of the 11th century BC are not preserved. Furthermore, if we accept the Ayasoluk as the location of the early Ionian settlement24 then the placement of the burial at the lower Embolos without a direct sightline to the settlement does not make sense. As a result Pausanias is not describing the actual burial of the founder but instead the cenotaph or heroon. It is difficult to discern to what extent the 13 m high structure – a fusion of a fountain and representative back wall – on the Embolos can be interpreted as a heroon of the founder. Furthermore the connection drawn by H. Thür to the spring Hypelaia – an important element of the foundation myth – cannot be upheld25. The fountain is fed by a canal and not a spring and thus invalidates the comparison. The reliefs of warriors associated with the monument, in particular the relief fragment H 376 with a rider, have been associated with the foundation legend by H. Thür26, but this cannot be securely proven27. Due to the absence of a funerary context or a connection to an actual person for the time being this monument is not treated as an intra-urban burial monument. 11The Memmius Monument (fig. 7) and Pollio Monument (fig. 8) are further examples that clearly demonstrate the ambiguous character of honorific monument and burial. The buildings were constructed in the Augustan period and are also located along the Curetes Street (fig. 4, resp. nos 32 and 28). 12The construction funded for C. Memmius on the upper Embolos is problematic in several respects and appears bizarre to the modern viewer28. We do not know the name of the patron nor are the achievements of Memmius known that would have permitted the construction of the honorific monument in such a prominent location. The monument does not represent a funerary monument in the traditional sense. But the wealth of architectural forms does make it a good example for the private representation and self-portrayal of Romans at the end of the 1st century BC. 29 Bammer 1976-77, 77-92; Berns 2003, 197-198; Alzinger 1974, 24- 26; Thür 1997, 70-72. 13The honorific monument of C. Sextilius Pollio must be viewed in a similar context and is in immediate proximity29. C. Sextilius Pollio gained great acclaim for his work on the water supply of Ephesus: He was in charge of the construction of the second Ephesian water conduit, the Aqua Throessitica (IvE 402). At the same time he was responsible for the construction of the Basilica Stoa on the upper agora (IvE 404). The unusual combination of honorific monument and fountain is an example for the intra-urban private representation of a worthy citizen of the city although no funerary context could be established. The question remains if the building had an inaccessible burial chamber, a sarcophagus in the upper story or an urn for ashes. 14Further examples of intramural honorific burials of the early Imperial period could be enumerated here30. 31 Cf. Hesberg 1992, 37-42; Berns 2003, 25-26. 79-81. 32 Schrumpf 2006, 74; Berns 2003, 140-141. 147. 15The process of competing self-representation appears to have changed after the rule of Augustus31. Over time the elaborate and outward orientated self-representation was abandoned for various reasons. The competition among the elites lost most of its political motivation owing to the power of the Imperial court. The rest of the population became more conscious of its membership to its own class and social unit as well as its upward boundaries. Luxurious self-representation went out of fashion in the early Imperial period inﬂuencing the norms for burial place and monuments. A general development in the social behavior towards death and funeral practices can be seen: an exalting representation oriented towards the exterior is later transformed into a more pensive, family-oriented memorial32. 16This process appears to have been more strongly articulated in Rome and the West and did not take place in the East with the same consequences. The interest of the former dominant figures of society for a visual memorialization of their status within the urban cityscape became less pronounced but some examples in Ephesus of the 2nd century AD clearly reveal that the phenomenon of honorific burial within the city still existed although it was no longer common33. 35 See also the contribution by Berns in this volume. 17One of the most eye-catching funerary monuments of Imperial date in Asia Minor, lying inside the city walls, was the Library of Tib. Julius Celsus Polemeanus (fig. 9)34. He was buried at the west end of the Embolos in the first quarter of the 2nd century AD (fig. 4, no 55). The building was excavated at the beginning of the last century and reexamined in the 1970’s. About 80% of the façade was still extant and allowed for a reconstruction. Celsus who actually came from Sardes and had had an exceptional career in the Imperial government, lived in Ephesus as proconsul of the province Asia. After his death a tomb was incorporated into a building that was unique in its impressive scale and lavish decoration. The importance and rank of Celsus within Ephesian society was highlighted through the centrality of his building within a major urban center. His exceptional importance is emphasized by the circumstance that this is an inner-urban burial and therefore a very prestigious recognition35. 36 Thür 1997; Cormack 2004, 42. 223. 37 On the individual and his endowments with further literature: Quatember 2011, 49-52. 18A sarcophagus found on the west side of the Heroon of Androclus may be the burial of another important Ephesian individual, a patron who was reported to have made several dedications at the end of the 1st and beginning of the 2nd century AD (fig. 10)36. The sarcophagus contained a skeleton of a 60-70 year old man as well as a marble portrait of an Imperial priest. The sarcophagus and portrait might have been buried in this place in Late Antiquity. Possibly they belonged to the intra-urban tomb of Tib. Claudius Aristion, thought to be located east of the Nymphaeum Traiani, which he founded37. 38 Cf. Berns 2003, 29-30. 52. 19Most of the intra-urban honorific burials have in common that they maintain a certain distance to the viewer and that they are inaccessible, as for example located above a high podium38. Thus they reﬂect the distance of simple citizens to the social elite. The Library of Celsus is an exception since it is open to visitors. 39 Cf. Foss 1979, 24; Drecoll 1997; Roueché 1997, 353-368. 20With the drastic decline of private patronage in Ephesus inner-urban honorific burials disappear in the course of the 3rd century39. The phenomenon of inner-urban burials again becomes popular in Late Antiquity when Christians started to bury the deceased adjacent to or even in churches40. At this point it did not make a diﬀerence whether the churches were located inside or outside the cities. 21One of the earliest examples of a church with burials inside was the so-called Seven Sleepers Cemetery, lying outside the city walls (fig. 11). The Cemetery of the Seven Sleepers is originally an Imperial burial complex of the 3rd century AD that, according to inscriptions, was already used at this point by Christians41. In the mid-5th century the emperor Theodosius II built a secondary church here. 22In the early 5th century the oldest bishop church of the city was constructed, the Church of Mary (fig. 12)42. Around this church a cemetery developed but it is difficult to date since the Christian burials in this cemetery usually do not contain any burial goods. Only in the 10th/11th century, the middle Byzantine period, can the cemetery be securely dated. At this time period intra-urban burials were again allowed. 23The intra-urban cemetery around the chapel of the so-called Byzantine Palace has a similarly late date (fig. 13)43. Although the representative building was constructed in the first quarter of the 5th century and functioned as the seat of a high-level governmental official with its impressively vaulted tetraconch, the cemetery dates to the 10th/11th century. 24Another intra-urban church, as for example the so-called Tomb of St. Luke (fig. 14)44, an Imperial fountain house (3rd quarter 2nd century AD) in the form of a hypaethral monopteros, was adapted into a church in the mid- to late-5th century but the associated cemetery cannot be dated. The first excavator of the monument, J.T. Wood, localized multiple burials in its vicinity in 186545. His documentation though has not been preserved. The building was definitely not the tomb of the evangelist Luke, who never was in Ephesus, but it was probably dedicated to him. As a result it could indirectly be a cemetery ad sanctos. 25In the course of our research on the harbor necropolis (figs. 2-3) we dealt with the question whether the intra-urban spaces were used systematically as cemeteries after this largest cemetery was abandoned in the 6th century. 26Our question essentially focused on the issue whether the inhabitants of the post-classical city still recognized the abandoned and partially deconstructed city-walls as a sacred boundary or border – similar to the pomerium of Rome46. In the course of the survey we were not able to detect any systematic burials within the city-walls of the surveyed areas. This is surprising since the reduction in size of the fortified city, at the beginning of the middle-Byzantine period47, meant that the former intramural city spaces were now extramural. And still this old boundary appears to have played a decisive role. 27But where were the cemeteries of the 7th, 8th and 9th century situated? Even within a clearly smaller Byzantine city there will have been enough spaces for burial. Regrettably we must admit that at the moment our knowledge about the location of the cemeteries at the beginning of the middle-Byzantine period is still very unclear. On the one hand we know of the extramural cemetery surrounding the cemetery of the Seven Sleepers. On the other hand we need to take into consideration that the cemeteries around the intraurban churches already existed much earlier but they cannot be accurately dated due to the lack of burial goods and assemblages. Furthermore, most of the churches including their possible cemeteries are lacking sufficient archaeological study. Since the phenomenon of intra-urban burials around churches began in other places already in the early-Byzantine period, this may also be suggested as a working hypothesis for Ephesus. 28The title of this paper mentions ‘wandering cemeteries’. We know the end point of the wandering but not all the stops along the way have been discovered. Still, the necropoleis of Ephesus oﬀer a great potential for further research and study, which we will continue to focus on in the next couple of years. Alzinger, W. 1974, Augusteische Architektur in Ephesos [SoSchrÖAI 16], Vienne, 1974. Alzinger, W. / Bammer, A. 1971, Das Monument des C. Memmius, FiE 7, Vienne, 1971. Ariès, Ph. 1981, The Hour of Our Death, New York, 1981. Bammer, A. 1972-75, “Die politische Symbolik des Memmiusbaues”, JÖAI 50, 1972-75, 220-222. Bammer, A. 1976-77, “Das Denkmal des C. Sextilius Pollio in Ephesos”, JÖAI 51, 1976-77, Beiblatt 77-92. Benndorf, O. 1898, “Vorläufige Berichte über die Ausgrabungen in Ephesus”, JÖAI 1, 1898, 53-72. Berger, A. 1982, Das Bad in der byzantinischen Zeit [Miscellanea Byzantina Monacensia 27], Munich, 1982. Burkert, W. 1977, Griechische Religion der archaischen und klassischen Epoche, Stuttgart, 1977. Berns, Ch. 2003, Untersuchungen zu den Grabbauten der frühen Kaiserzeit in Kleinasien [AMS 51], Bonn, 2003. Cormack, S. 2004, The Space of Death in Roman Asia Minor [WForsch 6], Vienne, 2004. Dagron, G. 1977, “Le Christianisme dans la ville byzantine”, DOP 31, 1977, 1-25. Drecoll, C. 1997, Die Liturgien im römischen Kaiserreich des 3. und 4. Jh. n. Chr. Untersuchungen über Zugang, Inhalt und wirtschaftliche Bedeutung der öﬀentlichen Zwangsdienste in Ägypten und anderen Provinzen [Historia Einzelschriften 116], Stuttgart, 1997. Engelmann, H. 1995, “Philostrat und Ephesos”, ZPE 108, 1995, 77-87. Engelmann, H. 1996, “Das Grab des Androklos und ein Olympieion”, ZPE 112, 1996, 131-133. 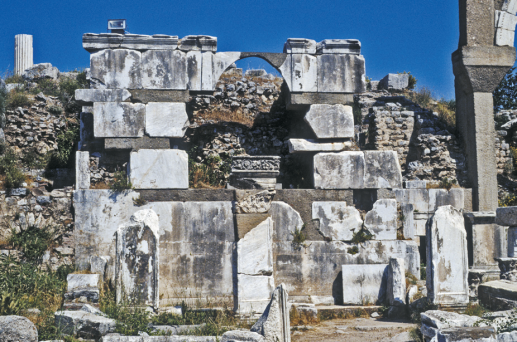 Foss, C. 1979, Ephesus after Antiquity. A Late Antique, Byzantine and Turkish City, Cambridge, 1979. Groh, St. / Lindinger, V. / Löcker, K. / Neubauer, W. / Seren, S.S. 2006, “Neue Forschungen zur Stadtplanung in Ephesos”, JÖAI 75, 2006, 47-116. Hesberg, H. Von 1992, Römische Grabbauten, Darmstadt, 1992. Hesberg, H. von / Zanker, P. 1987, “Einleitung”, in H. von Hesberg / P. Zanker (éds. ), Römische Gräberstraßen. Selbstdarstellung – Status – Standard. Kolloquium in München vom 28. bis 30. Oktober 1985 [AbhMünchen 96], Munich, 1987, 9-20. 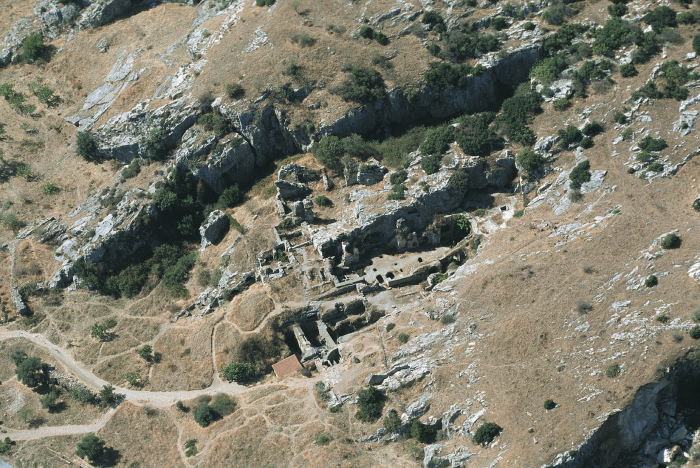 Hueber, F. 1997, Ephesos. Gebaute Geschichte, Mayence, 1997. Ivison, E.A. 1996, “Burial and Urbanism at Late Antique and Early Byzantine Corinth (c. AD 400-700)”, in N. Christie / S.T. Loseby (éds. ), Towns in Transition. Urban Evolution in Late Antiquity and the Early Middle Ages, Aldershot, 1996, 99-125. Jobst, W. 1972-75, “Zur Bestattungskirche der Sieben Schläfer in Ephesos”, JÖAI 50, 1972-75, Beiblatt, 171-180. Jones, C. P. 1993, “The Olympieion and the Hadrianeion at Ephesos”, JHS 113, 1993, 149-152. Kader, I. 1995, “Heroa und Memorialbauten”, in M. Wörrle / P. Zanker (éds. ), Stadtbild und Bürgerbild im Hellenismus. Kolloquium München 24. bis 26. Juni 1993 [Vestigia 47], Munich, 1995, 199-229. Karwiese, St. 1989, Erster vorläufiger Gesamtbericht über die Wiederaufnahme der archäologischen Untersuchung der Marienkirche in Ephesos [DenkschrWien 200], Vienne, 1989. Karwiese, St. 1994, “Stadion”, JÖAI 63, 1994, Grabungen, 21-24. Karwiese, St. 1995, “Stadion”, JÖAI 64, 1995, Grabungen, 22-23. Karwiese, St. 1999, “Die Marienkirche und das dritte ökumenische Konzil”, in R. Pillinger / O. Kresten / F. Krinzinger / E. Russo (éds. ), Efeso paleocristiana e bizantina – Frühchristliches und byzantinisches Ephesos [AForsch 3 = DenkschrWien 282], Vienne, 1999, 81-85. Keil, J. / Wilberg, W. / Theuer, M. 1944, Die Bibliothek [FiE 5.1], Vienne, 1944. Kerschner, M. 2008, “Die vorhellenistische Siedlungsgeschichte von Koressos. Archäologischer Befund und historische Interpretation”, in M. Kerschner / I. Kowalleck / M. Steskal, Archäologische Forschungen zur Siedlungsgeschichte von Ephesos in geometrischer, archaischer und klassischer Zeit. Grabungsbefunde und Keramikfunde aus dem Bereich von Koressos [9. ErghÖJh], Vienne, 2008, 109-118. Kolb, A. / Fugmann, J. 2008, Tod in Rom [Kulturgeschichte der antiken Welt 106], Mayence, 2008. Ladstätter, S. / Pülz, A. 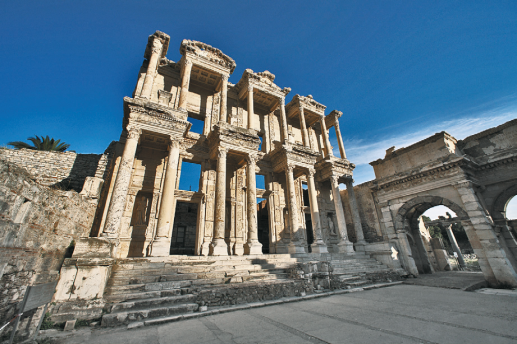 2007, “Ephesus in the Late Roman and Early Byzantine Period: Changes in its Urban Character from the Third to the Seventh Century AD”, in A.G. Poulter (éd. ), The Transition to Late Antiquity on the Danube and Beyond [Proceedings of the British Academy 141], Oxford, 2007, 391-433. 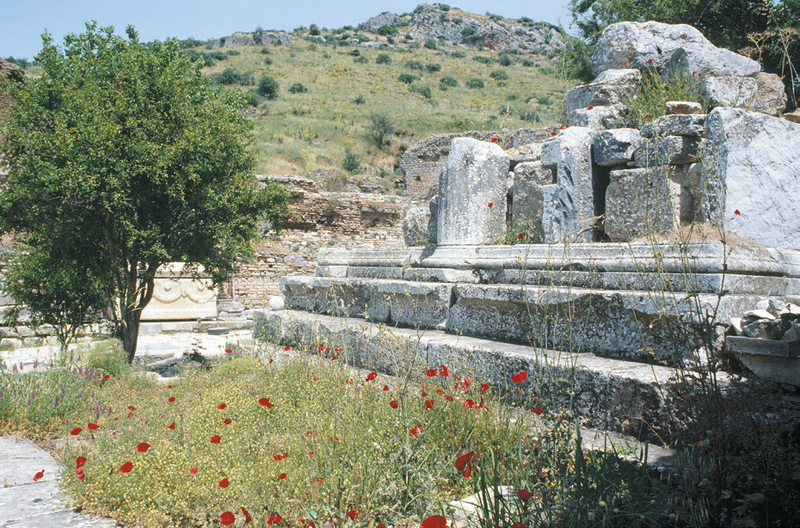 Lavan, L. 1999, “The Residences of Late Antique Governors. A Gazetteer”, AntTard 7, 1999, 135-164. Leone, A. 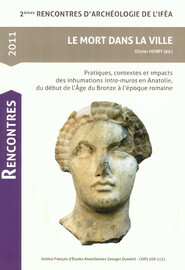 2007, “Changing Urban Landscapes: Burials in North African Cities from the Late Antique to Byzantine Periods”, in D.L. Stone / L.M. Stirling (éds. ), Mortuary Landscapes of North Africa [Phoenix Supplementary Volume 43], Toronto, 2007, 164-203. Miltner, F. 1937, Das Coemeterium der Sieben Schläfer [FiE 4.2], Vienne, 1937. Miltner, F. 1956-58, “XXI. Vorläufiger Bericht über die Ausgrabungen in Ephesos”, JÖAI 43, 1956-58, Beiblatt, 2-64. Miltner, F. 1958, Ephesos. Stadt der Artemis und des Johannes, Vienne, 1958. Miltner, F. 1959a, “XXII. Vorläufiger Bericht über die Ausgrabungen in Ephesos”, JÖAI 44, 1959, Beiblatt, 243-314. Miltner, F. 1959b, “XXIII. Vorläufiger Bericht über die Ausgrabungen in Ephesos”, JÖAI 44, 1959, Beiblatt, 315-380. Outschar, U. 1990, “Zum Monument des C. Memmius”, JÖAI 60, 1990, 57-85. Pietsch, W. 1999, “Außerstädtische Grabanlagen von Ephesos”, in H. Friesinger / F. Krinzinger (éds. ), 100 Jahre österreichische Forschungen in Ephesos. Akten des Symposions Wien 1995 [AForsch 1 = DenkschrWien 260], Vienne, 1999, 455-460. Pillinger, R. 2001, “Kleiner Führer durch das Sieben SchläferCoemeterium in Ephesos”, MiChA 7, 2001, 26-34. 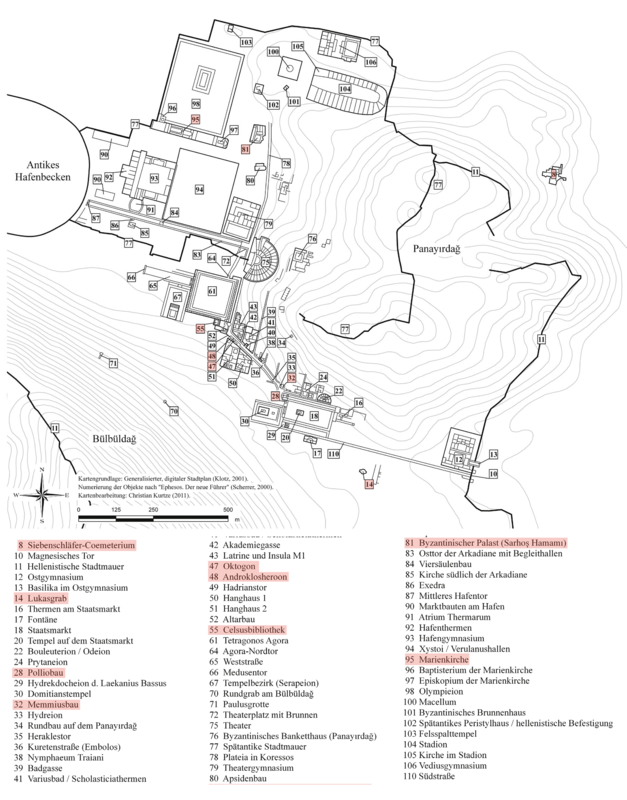 Pillinger, R. 2005, “Martyrer und Reliquienkult in Ephesos”, in B. Brandt / V. Gassner / S. Ladstätter (éds. ), Synergia. Festschrift Friedrich Krinzinger I, Vienne, 2005, 235-241. Plattner, G.A. 2005, “Review to Berns, Ch., Untersuchungen zu den Grabbauten der frühen Kaiserzeit in Kleinasien, AMS 51, Bonn, 2003”, BJ 205, 2005, 384-387. Plattner, G.A. 2009, “Zur Bauornamentik des Oktogons von Ephesos”, in S. Ladstätter (éd. ), Neue Forschungen zur Kuretenstraße von Ephesos. Akten des Symposiums für Hilke Thür vom 13. Dezember 2006 an der Österreichischen Akademie der Wissenschaften [AForsch 15 = DenkschrWien 382], Vienne, 2009, 101-110. Pülz, A. 2010, Das sog. Lukasgrab in Ephesos. Eine Fallstudie zur Adaption antiker Monumente in byzantinischer Zeit [FiE 4.4], Vienne, 2010. Pülz, A. 2011, “Das Stadtbild von Ephesos in byzantinischer Zeit”, in F. Daim / S. Ladstätter (éds. ), Ephesos in byzantinischer Zeit, Mayence, 2011, 51-81. Quatember, U. 2011, Das Nymphaeum Traiani in Ephesos [FiE 11.2], Vienne, 2011. Reisch, E. / Knoll, F. / Keil, J. 1932, Die Marienkirche in Ephesos [FiE 4.1], Vienne, 1932. Roueché, Ch. 1997, “Benefactors in the Late Roman Period: the Eastern Empire”, in M. Christol / O. Masson (éds. ), Actes du Xe Congrès d’épigraphie grecque et latine, Nîmes 4-9 octobre 1992, Paris, 1997, 353-368. Samellas, A. 2002, Death in the Eastern Mediterranean (50-600 A.D.): The Christianization of the East: An Interpretation [Studien und Texte zu Antike und Christentum 12], Tübingen, 2002. Scherrer, P. 1995, “The City of Ephesos from the Roman Period to Late Antiquity”, in H. Koester (éd. 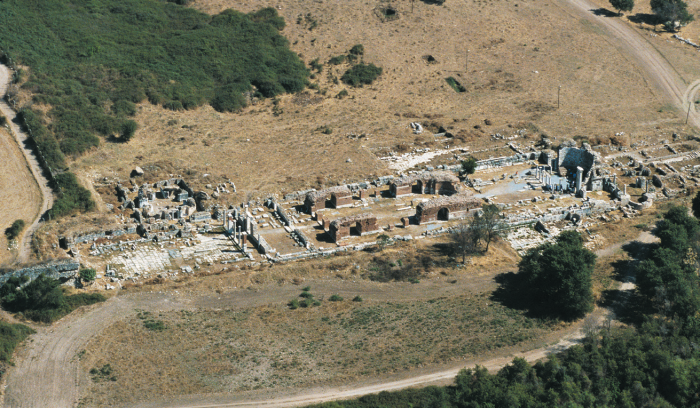 ), Ephesos. Metropolis of Asia. An Interdisciplinary Approach to its Archaeology, Religion, and Culture [Harvard Theological Studies 41], Valley Forge, 1995, 1-25. Scherrer, P. 2006, “Stiftergräber und Groma: Ergebnisse der Diskussion zum Südbereich der Tetragonos Agora in der frühen Kaiserzeit”, in P. Scherrer / E. Trinkl, Die Tetragonos Agora in Ephesos. Grabungsergebnisse von archaischer bis in byzantinische Zeit – ein Überblick. Befunde und Funde klassischer Zeit [FiE 13.2], Vienne, 2006, 34-36. Schörner, H. 2007, Sepulturae graecae intra urbem. Untersuchungen zum Phänomen der intraurbanen Bestattungen bei den Griechen [BOREAS – Münstersche Beiträge zur Archäologie Beiheft 9], Möhnesee, 2007. Schrumpf, S. 2006, Bestattung und Bestattungswesen im Römischen Reich. Ablauf, soziale Dimension und ökonomische Bedeutung der Totenfürsorge im lateinischen Westen, Bonn, 2006. Steskal, M. 2008, “Einleitung”, in M. Kerschner / I. Kowalleck / M. Steskal, Archäologische Forschungen zur Siedlungsgeschichte von Ephesos in geometrischer, archaischer und klassischer Zeit. Grabungsbefunde und Keramikfunde aus dem Bereich von Koressos [9. ErghÖJh], Vienne, 2008, 11-20. Stone, D.L. / Stirling, L.M. 2007, “Funerary Monuments and Mortuary Practices in the Landscapes of North Africa”, in D.L. Stone / L.M. Stirling (éds. ), Mortuary Landscapes of North Africa [Phoenix Supplementary Volume 43], Toronto, 2007, 3-31. Strocka, V.M. 1978, “Zur Datierung der Celsusbibliothek”, in The Proceedings of the Xth International Congress of Classical Archaeology, Ankara-Izmir 23.-30.09.1973, Ankara, 1978, 893-900. Strocka, V.M. 2009, “Die Celsusbibliothek als Ehrengrab am Embolos”, in S. Ladstätter (éd. ), Neue Forschungen zur Kuretenstraße von Ephesos. Akten des Symposiums für Hilke Thür vom 13. Dezember 2006 an der Österreichischen Akademie der Wissenschaften [AForsch 15 = DenkschrWien 382], Vienne, 2009, 247-259. Strocka, V.M. 2011, “Der Stifter-Sarkophag der Bibliothek von Nysa am Mäander”, in F. D’Andria / I. Romeo (éds. ), Roman Sculpture in Asia Minor. Proceedings of the International Conference to Celebrate the 50th Anniversary of the Italian Excavations at Hierapolis in Phrygia, held on May 24-26, 2007, in Cavallino (Lecce) [JRA Supplementary Series 80], Portsmouth, 2011, 269-278. Thür, H. 1990, “Arsinoe IV, eine Schwester Kleopatras VII, Grabherrin des Oktogons in Ephesos? Ein Vorschlag”, JÖAI 60, 1990, 43-56. Thür, H. 1995a, “The Processional Way in Ephesos as a Place of Cult and Burial”, in H. Koester (éd. ), Ephesos. Metropolis of Asia. An Interdisciplinary Approach to its Archaeology, Religion, and Culture [Harvard Theological Studies 41], Valley Forge, 1995, 157-199. 1 A general overview to the Ephesian necropoleis is provided by Pietsch 1999, 455-460; Trinkl 1997; Groh et al. 2006, 109-112. 2 The periodization of the late antique and Byzantine period varies. The following division is used in this paper: Late Antiquity 284 to 7th century AD; early-Byzantine period 395 to 6th century AD; middleByzantine period 7th century to 1204 AD; late-Byzantine period 1204- 1453 AD. 5 Cf. Schrumpf 2006, 63-64; Berns 2003, 27; Burkert 1977, 295; Young 1951, 67-134; Schörner 2007, 11-19. 10 Ivison 1996, 102: “By the ninth century burial occurred nowhere else but in and around churches …, whether within or without city”. 11 Ivison 1996, 103 demonstrates this on the example of Corinth where burials took place around the churches after the 5th century. Cf. also Leone 2007, 168, 189: intra-urban burials in North Africa were already common by the 4th and 5th century. 12 Ivison 1996, 102; cf. also Dagron 1977, 11-19; Ariès 1981, 29-42 as well as Stone/Stirling 2007, 25: “Despite earlier prohibitions against the burial of individuals within a built-up urban environment, it now served the religious needs of the early Christian community to bury individuals in sacred areas of the urban landscape. This provided easy contact between the dead and the living. She demonstrates that, rather than being random, the distribution of such burials can be linked to the presence of Christian cult centres”. 14 Cf. Ivison 1996, 105: “From the fourth century the decline of town councils and the growth of the powers of bishops led to this responsibility being passed to the Church. This increasingly made sense, since the desire to be interred ad sanctos, next to and inside churches and martyria, meant burial on church lands”. On the transfer of relics of saints and martyrs into the churches in the 5th century, cf. Samellas 2002, 221-224. 15 On this privilege cf. Varro l.l.6, 49; Kolb/Fugmann 2008, 15; Cormack 2004, 38: “A contrast can be drawn between this strict separation in the west and the usual practice in the east; such individuals were generally seen to have benefitted their society in some important fashion, for example through leadership, through the holding of public office, through financial donations to their communities, or through the attainment of intellectual distinction”. 18 Further examples: the Hexagon, a small hexagonal monument east of the Octagon, cf. 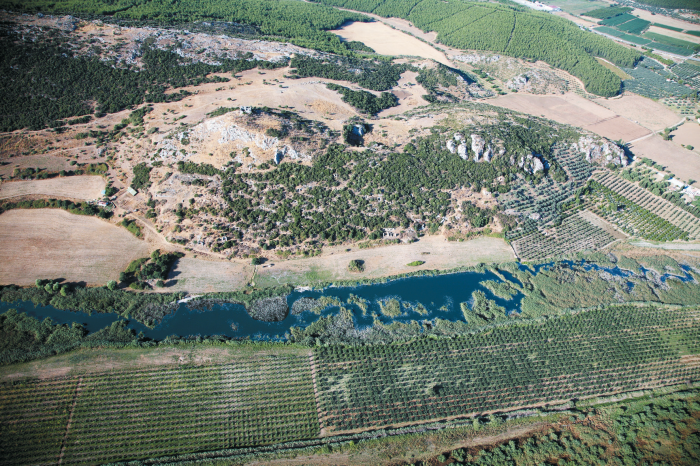 Thür 1996, 13-17; Berns 2003, 194; the tholos on the Panayırdağ, cf. Alzinger 1974, 37-40; Cormack 2004, 225-226; Berns 2003, 199; the tumulus on the Bülbüldağ, cf. Alzinger 1974, 57-58; Berns 2003, 199-202. Berns 2003, 68-79, 202-214 enumerates further hypothetical examples based on the analysis of spolia; cf. the critique of Plattner 2005, 384-387. 19 Thür 1990, 43-56; Thür 1995a, 178-183; Thür 2009, 9-28; Plattner 2009, 101-110; Thuswaldner 2009, 261-281; Waldner 2009, 283-315; Alzinger 1974, 40-43, 84-85; Cormack 2004, 41-42, 222; Berns 2003, 45-46, 197; Kader 1995, 199-229. 20 Thür 1995a, 176-177; Thür 1995b, 63-103; Thür 2009, 9-28; Waldner 2009, 283-315; Cormack 2004, 223-225 cf. also the term ‘Heroon’ 147- 160; Berns 2003, 43-44. 192-194. 26 Thür 1995b, 89, 98 refers to the rider as the type ‘Meleager’ or ‘Calydonian boar hunt’. He would later be cited on block A of the reliefs of the so-called temple of Hadrian. 27 The question of the warrior remains unresolved who according to Pausanias stood atop the tomb. In the reconstruction of H. Thür he is not included; but she does mention a surface for a pedimental figure or acroter that is situated on the ridge of the middle pediment; cf. Thür 1995b, 86. 28 Alzinger/Bammer 1971; Alzinger 1974, 16-20; Bammer 1972-75, 220-222; Outschar 1990, 57-85; Thür 1995a, 177-178 and 1997, 73; Berns 2003, 46-49. 194-196; Cormack 2004, 225. 30 The localization and interpretation of monuments as inner-urban burials is sometimes in need of further discussion: As for example the case of the Imperial freedmen Mazaeus and Mithridates who are named as patrons of the south gate of the Tetragonas Agora. According to P. Scherrer they were supposed to be buried in the East and West wing of the gate: Scherrer 2006, 34-36. See Thür 1997, 70-72 and 2009, 17-18; Cormack 2004, 225. 33 In addition to the examples listed cf. also the sarcophagus east of the south gate of the Tetragonos Agora of the sophist T. Claudius Flavianus Dionysius Rhetor: Thür 1997, 75; Engelmann 1995, 86-87; Cormack 2004, 42, 223. 34 Keil et al. 1944; Hueber 1997, 77-81; Strocka 1978, 893-900 and 2009, 247-259; Cormack 2004, 41. 46, 222-223. Cf. the similar findings in Nysa: Strocka 2011, 269-278. 40 Summary of the Ephesian churches: Ladstätter/Pülz 2007, 408- 417. In addition to the mentioned burial spaces surrounding innerurban churches further – imprecisely dated – burials were discovered around the small church in the Stadium, cf. Karwiese 1994, 21-24 and 1995, 22-23; around the church (?) in the north-east corner of the marble hall of the Harbor Gymnasium, cf. Benndorf 1898, 65; Scherrer 1995, 17; around the chapel on the Clivus Sacer, cf. Miltner 1959b, 362. 41 Zimmermann/Ladstätter 2010, 149-158. 203-207; Zimmermann 2011, 160-166; Miltner 1937; Pillinger 2001, 26-34 and 2005, 235-241; Jobst 1972-75, 171-180. 42 Reisch et al. 1932; Karwiese 1989 with older literature and 1999, 81-85; Zimmermann 2011, 141-142; Zimmermann/Ladstätter 2010, 186-187 as well as a summary of the dating: Pülz 2010, 134-135 fn. 881. 43 The monument is currently being scientifically studied by A. Pülz. In the meantime: Pülz 2011, 64-66; Vetters 1966, 278-280; Miltner 1958, 115-117; Miltner 1956-58, 3-17 and 1959a, 243-249; Foss 1979, 50-51; Berger 1982, 50; Lavan 1999, 148-149. 45 Wood 1877, 56-59. – In addition to the cemetery around the church two undated burial spaces with 23 individuals were discovered in the lower church in the base of the Imperial monument. 46 Leone 2007, 168-170: For her examples in the North African provinces she assumes that this border was no longer of relevance. 47 The Byzantine city walls were recently dated – although not exhaustively studied – to the end of the 6th or beginning of the 7th century; cf. Pülz 2011, 68-70. STESKAL, Martin. Wandering Cemeteries : Roman and Late Roman Burials in the Capital of the Province of Asia In : Le Mort dans la ville : Pratiques, contextes et impacts des inhumations intra-muros en Anatolie, du début de l'Age du Bronze à l'époque romaine [en ligne]. Istanbul : Institut français d’études anatoliennes, 2013 (généré le 18 avril 2019). Disponible sur Internet : <http://books.openedition.org/ifeagd/2456>. ISBN : 9782362450556. DOI : 10.4000/books.ifeagd.2456. Steskal, Martin. “Wandering Cemeteries : Roman and Late Roman Burials in the Capital of the Province of Asia”. Henry, Olivier. Le Mort dans la ville : Pratiques, contextes et impacts des inhumations intra-muros en Anatolie, du début de l'Age du Bronze à l'époque romaine. Istanbul : Institut français d’études anatoliennes, 2013. (pp. 243-258) Web. <http://books.openedition.org/ifeagd/2456>. HENRY, Olivier (dir.). Le Mort dans la ville : Pratiques, contextes et impacts des inhumations intra-muros en Anatolie, du début de l'Age du Bronze à l'époque romaine. Nouvelle édition [en ligne]. Istanbul : Institut français d’études anatoliennes, 2013 (généré le 18 avril 2019). Disponible sur Internet : <http://books.openedition.org/ifeagd/2057>. ISBN : 9782362450556. DOI : 10.4000/books.ifeagd.2057.